Krapfen were already in the Middle Ages a common dish during the carnival time (Fasching in Austria and South-Germany). The rich, fatty foods, should prepare people for the 40 days of Lent. Instead of eating bread people ate doughnuts in the carnival time. Even today for many Faschingskrapfen are a fine meal to the strenuous carnival time, the celebrations and all the dancing. The dough is, in fact, easy to prepare, as it is a yeast dough, it needs rest and time to go. 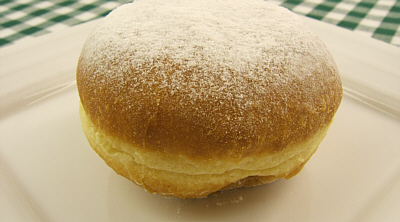 The so-called Berliner is a doughnut similar to Faschingskrapfen. Add the yeast to 3 tablespoons warm milk (dried yeast can be directly added with the flour). Mix this milk with 150g flour to a first dough (Teigerl). Put some flour on the dough, cover with a cloth (e.g. a kitchen towel) and leave covered in a warm place to rest for 25min. Mix egg yolks and sugar until fluffy. Then add egg wihte, liquid butter, the remaining milk, flour and add to the first preapred dough. The dough must now again rest for 25min. Now the forming process starts, out of the dough you form 20 balls, and leave them for 45min, so they can rise to the size of Faschingskrapfen. Heat the oil, and fry the doughnuts first on one side, then on the other. This creates the classic form with the white belt. Let the doughnuts drain on kitchen paper. Meanwhile, prepare the filling: Stir apricot jam until smooth, sometimes with a little liquid the jam smoothes more easily. For adults, use rum. Insert this filling with an icing bag in the doughnut. Dust with sugar, serve and enjoy. 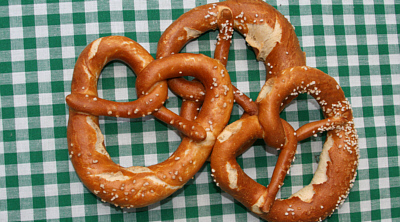 The typical stuffing of faschingskrapfen is apricot jam, usuallys with a little rum. For the more creative you can of course use other filling for the doughnuts: like vanilla cream filling, or chocolate cream, or perhaps even with egg-cream liqueur. To the imagination and carnival mood are no limits. Dress up as football fan with Handmade Handbag "Michael"